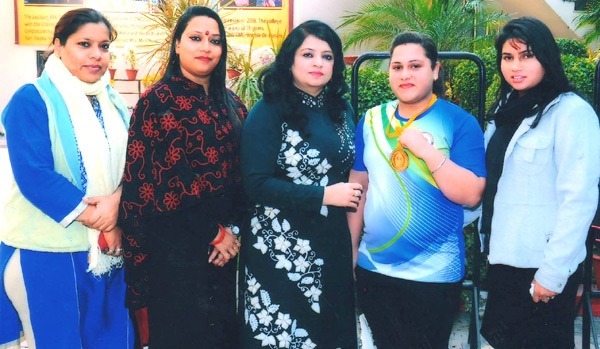 Ms. Gagandeep Kaur, Weight Lifter of BBK DAV College for Women, Amritsar won Gold Medal in (75kg. Weight Category) in All India Inter-University Weight-lifting Championship held at Guntur (Andhra Pradesh) from Nov. 27th to 29th, 2018. Principal Dr. Pushpinder Walia congratulated the young achiever and motivated her to maintain her performance in future as well. The Principal added that the college players have always given their best in various championships and brought laurels to their alma mater. Mrs. Sweety Bala, Head, Department of Physical Education, and Physical Education teachers Ms. Savita Kumari, Gaganpreet Kaur & Rajdeep Kaur and other faculty members felicitated the players on their achievements.